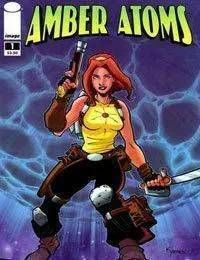 Blast-off with the newest sci-fi adventure heroine Amber Atoms! Follow the ongoing adventures of this modern day Flash Gordon as Amber dreams of leaving her mundane life, but not exactly how she imagined. Mercenaries and aliens suddenly invade Ambers world as she learns that her family history could decide the fate of the galaxy.